Ever wonder why brides carry on their hands a bunch of flowers to the altar? A question asked by a friend here being June and that is next month, the most popular month for weddings. Well, it has quite a long history; the Greeks believed it comes along with it true and never ending love. Ancient people believe it’s for protection, because the spice, the herb leaves, the flowers drive the bad spirits away. It was also said that the flowers symbolize fertility. Today it has evolved and has stand as a symbol of good luck for those who will be able to catch it at the reception. 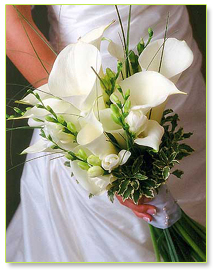 In the Philippines, a single lady who is lucky enough to catch the bouquet is believed to get married next. That is why those ladies who wouldn't want to catch up luck would cover themselves somewhere in the catching crowd. On the other hand, we cannot discount the fact that wedding flowers also stand as a status symbol of the bride, the more expensive the flowers, the higher her economic status is in society. You don't need to be an economic expert to tell, I observed that myself as I had been to the most celebrated weddings that even brought in crates of the loveliest of tulips from Holland and had attended a lowly ritual with just a single white chrysanthemum on a bride’s hand. Whatever it is this wedding as a social ritual really had made this society somehow alive and has made it get going. I did not know about that. Thanks for posting it. Such a nice information.